I visited Kitchen Bar during one of those moments where I felt like I wanted to try something new instead of eating at the same old restaurants in Providence (no matter how good they may be). I still wanted a filling meal that wasn’t going to leave me in a food coma, but that also wasn’t too froufrou (that’s right, I said “froufrou”). 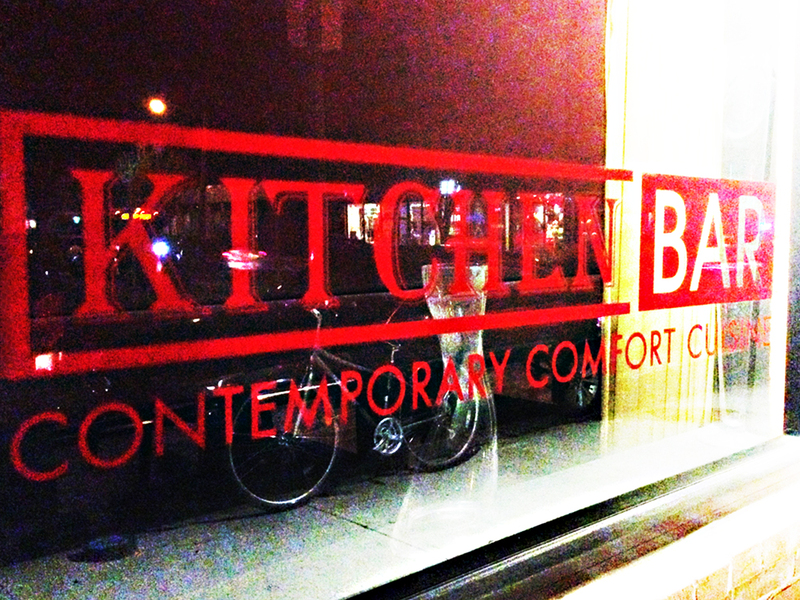 My wife suggested that we try Kitchen Bar on Hope Street because it seemed like a place that served upscale pub food. That description fit the bill, so we went ahead and gave it a shot. The restaurant has a very simple design out front and is perched on the corner of the block. The name of the restaurant might come off as a little confusing to some people driving by that just see the word “Kitchen” in bright lights over the door. Nonetheless, that very well may be what the owners are going for if the message is that eating there is all about the comfort foods that come out of many American household kitchens. The interior is warm, but dark and tends to rely on some of the lights outside of the restaurant windows to illuminate the meal. It may even be too dark at times (you’ll see in my photos that just after the appetizer, they dimmed the lights even more, so I apologize for the grainy quality). It’s not a huge restaurant, but along with the bar, it can seat quite a few people. As for the service, nothing really stood out, which isn’t a bad thing because I’d rather have unmemorable service rather than bad service any day. I do remember that our server was friendly though. As our appetizer, we ordered what may have been a special that night because I no longer see it on Kitchen Bar’s online menu. It was something like a cassoulet with a bone-in leg of duck, sausage strips, and served over a bed of molasses sweetened beans or grits. 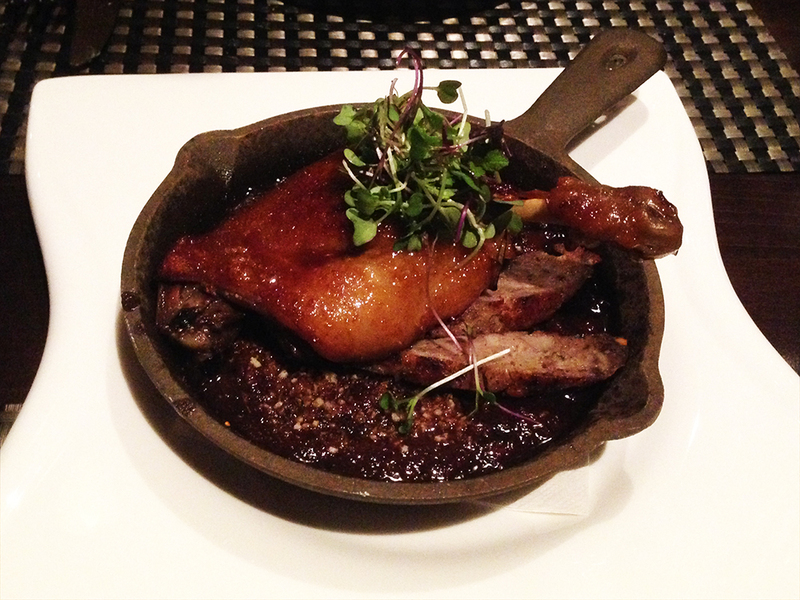 I was very impressed with this dish because the duck was cooked perfectly with a crispy yet sweet skin that complemented the immensely tender meat of the leg. The sausage added a nice flavor and texture to the dish without overpowering any of the ingredients. Lastly, the molasses-sweetened beans (or grits, I can’t quite remember exactly), really tied the whole dish together. We could taste the molasses, which on it’s own was a little too sweet, but it wasn’t overpowering of the other ingredients at all. Instead, the sweetness went superbly with the duck and sausage because of the contrasting balance. 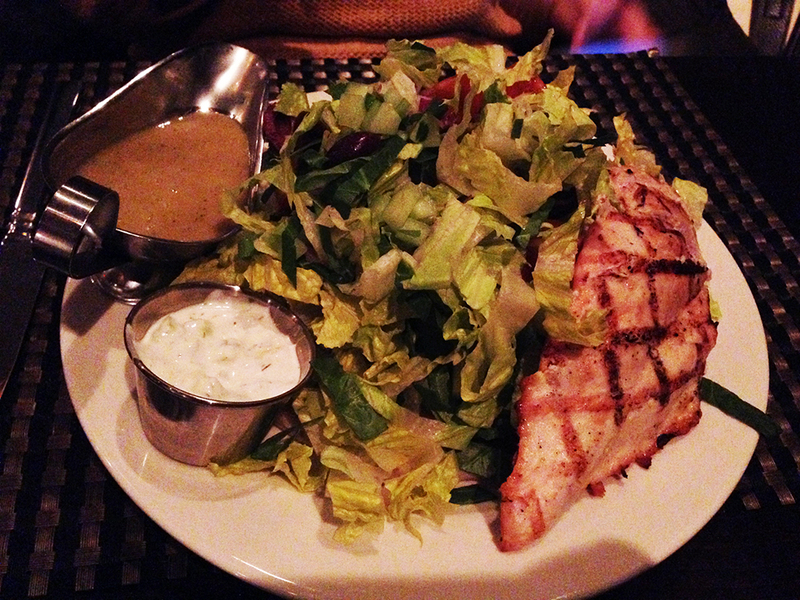 My wife ordered the Greek Salad and added a chicken breast to the meal. Overall, her salad was fresh and the Greek ingredients were well balanced rather than sloppy as some places might make a Greek salad. She did ask for the dressing on the side, which may have helped. The chicken came out well-grilled and heading towards the dry side, but still tasted good, especially with the tzatziki sauce. 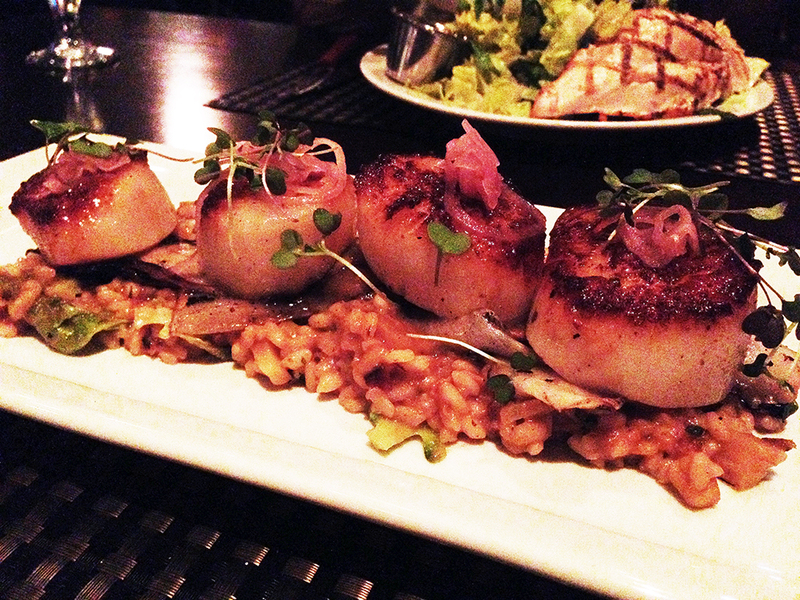 I ordered the seared scallops over the pork belly risotto. When the dish arrived, I was surprised at the good number of scallops that came with the dish, but even more surprised at the size. These scallops were gigantic! Despite being so large, they were also expertly cooked so that they had all the flavor of the sear and yet evenly cooked throughout. They were perfectly tender and very filling. The pork belly risotto was heavy, full of flavor, and went well with the scallops. I really couldn’t place the pork belly in the risotto because it didn’t stand out, but the overall flavor was very good. The dish didn’t necessarily look that big at first glance, but I was more than full after finishing the scallops and I couldn’t finish all of the risotto. There are some mixed reviews online, but my personal experience was positive. I very much enjoyed my meal at Kitchen Bar. I could see the concept of the restaurant shining through as a place that serves high quality comfort food. Kitchen Bar’s classy take on comfort food is worth trying out if you’re looking for something filling and different yet familiar all at the same time. The scallops and pork belly risotto sound amazing! !